Not a fan of media theorist Marshall ‘the medium is the message’ McLuhan? Okay, I don’t go in for the technological determinism either, but you can’t deny that the man was uncannily prescient when it came to predicting how our culture would develop – a ‘global village’, electric technology ‘reshaping and restructuring patterns of social interdependence and every aspect of our personal life’ – and how these changes would be feared – ‘we drive into the future using only our rear view mirror’. He even divined the demise of print culture, and ‘electronic interdependence’. Ahem. 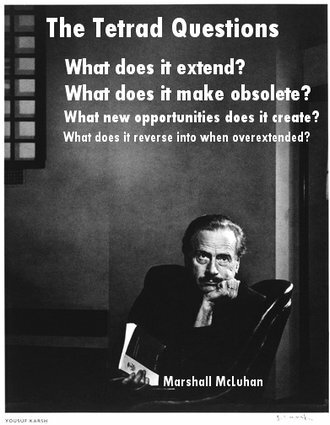 I’ve been thinking a lot about McLuhan because I’ve been teaching a course on online media. At first, I thought about him in relation to convergence: the way all forms of media are starting to closely resemble each other (see 3AW for instance, where you can now watch videos of radio personalities on air). McLuhan wrote about the effects of technology on culture and our relations within that culture. He posited that technology created new environments that then shaped our cultural patterns, but we didn’t have the objectivity required to perceive these patterns. Instead, we’re lured by the content – a breaking story here, a blog post there – rather than looking at the medium and how it’s shaping and changing our world, our thought patterns, our interactions, which, even now, are being shaped by the internet. Or this may be what McLuhan had said, if he lived to see the web. So, some extrapolation is needed. In the past, when print was the dominant medium, if we imagined writing a story, we’d imagine a story with a beginning, middle and an end, the easily recognisable three-act structure. But the web, with its multimedia, interactivity and non-linearity, is changing the way we write, create, communicate and structure. How do you write a story if you know your potential audience now expects more than the singular and linear? Now, I’m sort of of the opinion that Keen should be banned from ever penning another book because 1) he sees no cultural value online, and 2) he cites Judith Miller and Thomas Friedman as journalistic pillars of society – and yet, this uncritical view of content reminds me of McLuhan and the idea that it’s the medium that matters. Writers like Keen, for instance, are possessed of the idea that the paper and news is authoritative and collective, while the screen is individual and narcissistic – without any critique of the information delivered or how it’s delivered. Maybe it’s unfair to lump McLuhan in with the likes of Keen and Carr. After all, McLuhan focused on the social and cultural shifts of technology (as opposed to ‘the micro-levels of neuroscience’), and he’s been dead for 31 years – who can say what he would have made of the web. If McLuhan is trying to tell me something from beyond the grave, it may just be: ‘It is the framework which changes with each new technology and not just the picture within the frame.’ I’ll have to think on that a while. I think our friend Marshall might suggest that the newly (as in last 10 years or so)dialogic and interactive, non-linear nature of news writing offers us a few pointers as to how we might tell stories in to potential future audiences. As longer form texts(eg short stories and novels) become digitized in the same way that newspaper stories have, I expect we’ll see readers wanting to become as involved in their construction as they are in newspaper stories. And if we can use video, stills, hypertexting and audio in our longer form stories, then I suspect we probably will; Marshall again. There’s also an (often unacknowledged) right-wing element to McLuhan’s thought–he was deeply influenced by Wyndham Lewis’s America and Cosmic Man (and friends with Lewis, as well)–which might form the (legitimate) basis of your uneasiness with him. I suspected as much (well, not the Lewis connection). 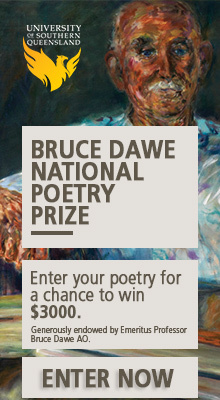 Have heard of some interesting critiques of his work, though am yet to read them. Thanks for a topical and thought-provoking piece. I agree with much of the post but take issue with two points. First that Keen should be banned from penning another book. Yes, Friedman and Miller are hardly journalistic pillars but have you read some of the material that passes for reportage let alone commentary in so-called ‘newspapers of record’? Compared to that drivel Friedman is a colossus striding the intellectual stage with the penetrative insight of the greatest of political philosophers.nhe also has a point concerning the public value of a common news outlet for societal coherence. I’m not sure it needs to extend to commentary or must take the form of a newspaper but it must provide the institutional support for those with the ability and interest to report around issues of governance and controversy free of time znd agenda pressures. Second, I wonder whether the framework does change with the form of technology. If you mean to say narrative structure then perhaps that is correct but my initial thought concerned the vested interests which subtly shape societal concerns. Isn’t every technology subject to initial experimentation by those who invent it with monied interests hot on their heel contributing capital in the guise of refining and capacity building whilst channeling the use to which the technology is put while those in authority finally regulating the technology once it becomes sufficiently widespread to pose a possible threat to their control? Apologies for the typo anove. Bloody IPad virtual keyboard is a little had to negotiate at 3.28 in the morning! It was meant to read ‘Jacinda’ rather than ‘Jack da’. 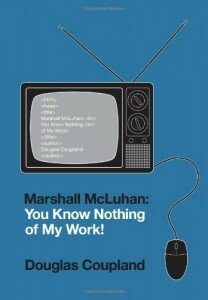 I always found myself drawn to McLuhan while sharing you unease about the absolutism inherent in some of his arguments. That been said I’m particularly interested in your last point as society is undergoing an unconscious transformation of communication frameworks, in many cases not realising the implicit effect on what is contained within the frame. The transference of print to digital in the publishing world strikes me as a perfect case study as corporate interests seek to monetise their existing content through straight replication of print form to a digital form, which in my mind inevitably leaves space and room for the colonising of that space with content that is better adapted to digital. I agree that hot on the heels of any success in that space will be those same traditional publishers seeking to bring it back into their framework, however I am more optimistic that in an unfamiliar landscape traditional battle plans can be defeated by the smaller more nimble player. I can’t help but feel though that the traditional publishing world in trying to replicate the print model of their business in the digital sphere is heading down a cul de sac… while these new spaces and models (social media, twitter, blogs etc are always used as examples but with the rapidity of take-up of new ideas these are in my mind only early pointers to the possibilities of the future) gain mainstream traction and the next generation’s consumption of content shifts from longform writing to these and other styles. Not sure what this means for the current framework, but a fair bit of experimentation is certainly called for. Thanks for this article which is quite fascinating, not least in the way that your writing reflects exactly what you are writing about. Your quotes from book reviews are perhaps the best example of current practice of blog writing on cultural trends, where the writer doesn’t ever read an entire work, but quote-mines from reviews or picks up short clips which have been extracted by someone else who has watched the whole interview/film/documentary. A beautiful example of how our reading and attention patterns have changed in response to the medium. Great stuff! hey a great tool for presenting information and ideas to your students in a totally non-linear (literally!) way, is by ‘prezi’ – a tool where you can give your information in circles, lumps, clumps and bumps, waves, upside down, squares etc. professionally. Students enjoy it and it looks fun. prezzie.com, it free. it gives you a tutorial and you can insert all the multimedia you want to show your audience.